Why is it that in some American English words the letter ‘A’ gets pronounced as [eə] despite the phonetic transcription describing it as [æ]? … then you should definitely read the rest of this article and watch the video above! Let’s take a very simple word such as “frank”, for example. Any dictionary will tell you it’s pronounced as /fræŋk/ while in reality it’s to be pronounced as [freənk] – it’s almost as if the actual word is “frenk” instead of “frank”. So, over the time I’d noticed that the “ash” sound [æ] is often pronounced as [eə] in American English, but I couldn’t figure out WHEN it’s happening – I mean, are the any RULES? I recorded the first video about it (watch it HERE) a year and a half ago – the conclusion was that you just have to learn which words are subject to the letter ‘A’ sound transformation. Then I recorded a video as a response to Greg’s comment where the main focus is on the word “family” – I pronounce it as [feəmli] whereas Greg sticks with [fæmli]. HERE’s the Wiki article about Æ tensing – yes, turns out the technical term for this pronunciation transformation I’d been noticing is Æ tensing, and it also turns out there are definite rules to follow. To put it simply, if the “ash” sound is followed by the following sounds: R, M and N, the letter ‘A’ is pronounced as [eə] in General American pronunciation – and it’s called Æ tensing. Moreover, I found out in the same article that if you were to tense the “ash” sound at all times, it wouldn’t be so wrong either, because there are American accents – such as Chicago – were it’s tensed in all words. Turns out, I wasn’t so wrong advising you to do so in the second video! 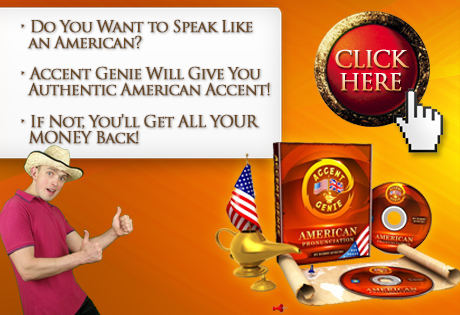 But if you’re going to argue that if you were to do that, it wouldn’t be pure General American pronunciation, let me tell you this: if we, foreigners, manage to speak fluent English with an accent that sounds even 80% American, it doesn’t really matter whether it would be perceived as the General American, Boston or Chicago accent. I’ve spoken about it previously – please check out this video HERE – but of course, it’s nice to finally be aware of the rules determining when the American “ash” sound becomes tense and try to get it right just like the General American. A word like “Frank” is *never* pronounced with [eə]. It’s more like [æɪ] or [ɛɪ] or even [eɪ], but with an upglide rather than an offglide, which would sound unnatural before a velar consonant. Before /m/ and /n/, it’s often [eə] or [ɛə] or even [ɪə], though not always or necessarily so. Before /r/, /æ/ is actually replaced by /e/ so that i.e. “marry” is identical to “Mary.” I personally would advise EFL students against tensing all of their /æ/s–unless they’re aiming for a Chicago- or Buffalo-like accent, which is not usually considered prestigious or even pleasant to the ear. I was going to comment few weeks ago but I had technical issues with my computer and I had serious problems to watch your videos and comment them. And I also did some research to find out much more explicit answers for our ash-sound problem but practically I couldn’t find any much better explanations and as the result I became even more confused about the ash-sound. But anyway I hope my technical issues are finally solved now and I’m glad I can watch your videos. 1) Æ Tensing varies in the continuous interval from [æ] to [ɛə] to [e̞ə] to [eə] to [ɪə] where [e̞] is “actual proper e” to my ears and [e] in IPA is another weird sound between “actual proper e” and [i] according to the IPA vowel chart of Wikipedia. In other words and in my present understanding the most fundamental Æ Tensing and variation happens with the openness of mouth or equivalently with the general position of tongue (from lower to higher). In my present understanding this means that the continuous variation from [æ] to [ɛə] to [e̞ə] to [eə] to [ɪə] is the same thing as the change in the openness of mouth from open to closed or equivalently the change in the general position of tongue from lower to higher. This is pretty much clear logically but correct me if I have understood something wrongly! I deduced those conclusions from Wikipedia and from video series in JenniferESL https://www.youtube.com/playlist?list=PL4B28722936C871E8 . I found those videos in JenniferESL quite useful because the technical terms and the characters of IPA are sometimes confusing for me. Naturally I’m pretty familiar with the basic IPA symbols which are used in schools but more sophisticated symbols like aforementioned mid front unrounded vowel [e̞] and the difference between mid front unrounded vowel [e̞] and close-mid front unrounded vowel [e] are new for me. Therefore I also ask once and for all: Can you recommend some good and clear resource or site to learn IPA properly? 2) Is Æ Tensing usually really rather “modified ash [æ] followed by schwa [ə]” than “pure monophthong variation without schwa” as it was in the Rachel’s video and in the Æ Tensing chart in Wikipedia? For me, it’s a bit surprising because I thought before that Æ Tensing is rather monophthong variation than diphthong variation. 3)What is the weird symbol combination [æʲə] in Southern accents in the Æ Tensing chart in Wikipedia? I thought that Æ Tensing in Southern accents is much more e-like than in any other accent. Have I had somehow wrong idea about Æ Tensing in Southern accents? That’s perhaps pretty much all I’m going to say about this [æ] Tensing issue after my previous (unpublished) comments but thanks a lot for this ash-sound video series, Robby. It gave clarification about sometimes weird English sounds and even though I’m more interested to improve my General English fluency and pronunciation, it was really interesting to learn about [æ]-sound in detail and it’s good because after all it plays its own role in English improving. Finally I got around to responding to this comment, sorry for the long wait! 1) Yes, you’re totally correct in saying that the more Æ is tensed, the more you close your mouth and your tongue position moves from behind the lower teeth to a raised one. Speaking of a resource to learn IPA – well, I couldn’t give you one! I’m personally a proponent of not analyzing the whole thing too much, so I have to admit I haven’t been reading PLENTY about it. Well, I have, but I don’t do it regularly therefore there’s no need for me to keep track of certain resources. If I don’t know something – like the Æ tensing – I’ll do a research on it, but that’s pretty much all. I’m not going to be bothered learning every IPA symbol because I think the more you analyze the whole thing, the more confused you’ll become! 2) I’d say that Æ tensing doesn’t involve Æ followed by schwa. I think that when you tense Æ you get a unique sound on its own! 3) Speaking of the Southern accent – weird string of symbols represent a stretched sound; Southerners tend to do Æ tensing by extending the sound as if making two syllables instead of one out of it! Next post: American English Pronunciation: “What’s The Matter With You”?